Hitler Goes Kaput! (Russian : Гитлер капут!) is a Russian 2008 comedy film directed by Maryus Vaysberg. The picture was followed by a sequel titled Rzhevsky versus Napoleon . Maryus Erikovich Vaysberg, also known as Marius Balčiūnas-Weisberg, is a Russian film director, producer, and screenwriter of Lithuanian and Jewish descent. 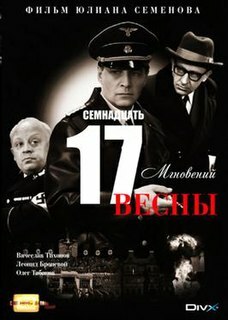 Seventeen Moments of Spring is a 1973 Soviet twelve-part television series, directed by Tatyana Lioznova and based on the novel of the same title by Yulian Semyonov. The Great Patriotic War is coming to an end, and soon will be May 9, 1945. Soviet intelligence officer Alexander Isaevich ("Shura") Osechkin works as an SS officer in Berlin under the name of Standartenführer Olaf Schurenberg. He is engaged in office work and hangs out in nightclubs. The Schutzstaffel was a major paramilitary organization under Adolf Hitler and the Nazi Party (NSDAP) in Nazi Germany, and later throughout German-occupied Europe during World War II. It began with a small guard unit known as the Saal-Schutz made up of NSDAP volunteers to provide security for party meetings in Munich. Soon radio operator Zina is sent from the Center. Shura and Zina fall in love with each other. Müller sends Iron Hans to deal with Schurenberg, but Shura manages to kill Hans. Bormann blackmails Shurenberg under the threat that he will tell everyone that he is a spy if Schurenberg does not agree to intimate relations with him. Shurenberg, realizing that he is on the verge of failure, is going to leave on a special channel to his homeland. At this point, the Gestapo seizes and tortures Zina. Shurenberg deceitfully signs the document for her transfer from Bormann and takes her away. They together attack Adolf Hitler and Eva Braun, tie them up and take away their clothes. After changing clothes, they try to leave the Gestapo, but they are discovered. They run away and drive by car to the border. On the Soviet border, they understand that their homeland is not very happy to see them either, and now they are fleeing both from the Germans and from the Russians. Kuzmich (Shura's friend) opens a door in a wall through which they leave. In the final scene, Shura and Zina flee into the distance. Eva Anna Paula Hitler was the longtime companion of Adolf Hitler and, for less than 40 hours, his wife. Braun met Hitler in Munich when she was a 17-year-old assistant and model for his personal photographer Heinrich Hoffmann. She began seeing Hitler often about two years later. She attempted suicide twice during their early relationship. By 1936, she was a part of his household at the Berghof near Berchtesgaden and lived a sheltered life throughout World War II. Braun was a photographer, and she took many of the surviving colour photographs and films of Hitler. She was a key figure within Hitler's inner social circle, but did not attend public events with him until mid-1944, when her sister Gretl married Hermann Fegelein, the SS liaison officer on his staff. Pavel Yurievich Derevyanko is a Russian theatre and film actor. Untersturmführer was a paramilitary rank of the German Schutzstaffel (SS) first created in July 1934. The rank can trace its origins to the older SA rank of Sturmführer which had existed since the founding of the SA in 1921. The rank of Untersturmführer was senior to Hauptscharführer and junior to the rank of Obersturmführer. Hitler: The Last Ten Days is a 1973 British-Italian biographical drama film depicting the days leading up to Adolf Hitler's suicide. The film stars Alec Guinness and Simon Ward, and features an introduction presented by Alistair Cooke; the original music score was composed by Mischa Spoliansky. The film is based on the book Hitler's Last Days: An Eye-Witness Account by Gerhard Boldt, an officer in the German Army who survived the Führerbunker. Location shooting for the film included the De Laurentiis Studios in Rome and parts of England. Hans Otto Georg Hermann Fegelein was a high-ranking commander in the Waffen-SS of Nazi Germany. 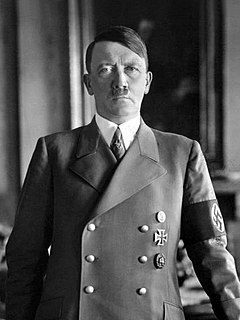 He was a member of Adolf Hitler's entourage and brother-in-law to Eva Braun through his marriage to her sister Gretl. Heinz Linge was an SS officer who served as a valet for German dictator Adolf Hitler. Linge was present in the Führerbunker on 30 April 1945, when Hitler committed suicide. The Bunker, also published as The Berlin Bunker, is an account, written by American journalist James P. O'Donnell and German journalist Uwe Bahnsen, of the history of the Führerbunker in early 1945, as well as the last days of German dictator Adolf Hitler. Its English edition was first published in 1978. However, unlike other accounts, O'Donnell spent considerable time on other, less-famous residents of the bunker complex. Additionally, unlike the more academic works by historians, the book takes a journalistic approach. The book was later used as the basis for a 1981 CBS television film with the same name. Otto Günsche was a mid-ranking officer in the Waffen-SS of Nazi Germany during World War II. He was a member of the SS Division Leibstandarte before he became Adolf Hitler's personal adjutant. 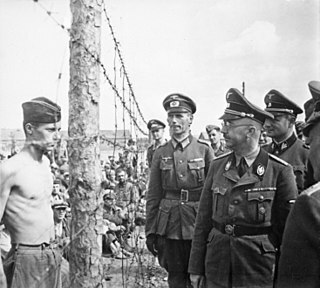 Günsche was taken prisoner by soldiers of the Red Army in Berlin on 2 May 1945. After being held in various prisons and labour camps in the USSR, he was released from Bautzen Penitentiary on 2 May 1956. Erich Kempka was a member of the SS in Nazi Germany who served as Adolf Hitler's primary chauffeur from 1934 to April 1945. He was present in the area of the Reich Chancellery on 30 April 1945, when Hitler shot himself in the Führerbunker. Kempka delivered the petrol to the garden behind the Reich Chancellery where the remains of Hitler and Eva Braun were burned. Until the Final Hour, also published as Until the Final Hour: Hitler's Last Secretary or simply Hitler's Last Secretary is a memoir of the last days of Hitler's government, written by Traudl Junge in 1947, but not published until 2002 and 2003. The book was part of the basis for the 2002 Austrian documentary Im toten Winkel - Hitlers Sekretärin and the film Der Untergang in 2004. Speer und Er is a three-part German docudrama starring Sebastian Koch as Albert Speer and Tobias Moretti as Adolf Hitler. It mixes historical film material with reconstructions, as well as interviews with three of Speer's children, Albert Speer, Jr., Arnold Speer and Hilde Schramm. Moloch is a 1999 Russian biographical drama film directed by Alexander Sokurov. The storyline was conceived from a screenplay written by Yuri Arabov and Marina Koreneva. It portrays Adolf Hitler as a humanized figure, living life in an unassuming manner during an abrupt journey to the Bavarian Alps. The film stars actors Leonid Mozgovoy, Yelena Rufanova, Vladimir Bogdanov, and Leonid Sokol in principal roles. 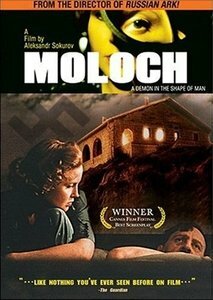 Moloch explores companionship, intimacy and dictatorship. The Last Ten Days is a 1955 Austrian-German drama film directed by Georg Wilhelm Pabst. It was the first film in post-World War II Germany to feature the character of Adolf Hitler. Ewald Lindloff was a Waffen-SS officer during World War II, who was present in the Führerbunker on 30 April 1945, when Hitler committed suicide. He was placed in charge of disposing of Hitler's remains. Lindloff was later killed during the break-out on 2 May 1945 while crossing the Weidendammer Bridge under heavy fire in Berlin. Rzhevsky Versus Napoleon is a Russian 2012 comedy film, sequel to the 2008 picture Hitler goes Kaput! ↑ "Кассовые сборы в России + СНГ". KinoMetro. 1 2 "Гитлер капут!". VokrugTV. ↑ "Filmsatire "Gitler kaput" - Die nackte russische Kanone". Der Spiegel. ↑ Kirill Voloshin. "Гитлер капут: много бородатых анекдотов, немного Джона Ву". Argumenty i Fakty. ↑ "Петербургские коммунисты требуют запретить фильм "Гитлер капут!"". RIA Novosti. ↑ "Петербургских коммунистов оскорбил фильм "Гитлер капут"". Lenta.ru.